Julia Swain is a Los Angeles based cinematographer known for emotion-driven imagery that consistently seeks to portray the human experience. Swain has shot for National Geographic, MTV, A&E, VH1, Coca-Cola, and ARRI. Jacob Schwarz is an American-based film director and cinematographer. With his wife, Katie, Schwarz founded the production company, Mystery Box, that has gained more than 100 million views on their YouTube channel. Kelly Mena is a filmmaker and producer, as well as the Executive Producer of Video Production at B&H Photo. She runs the internal video production team which creates tutorials, interviews, and new product livestreams. Sam Bilodeau is the Post Production Supervisor, colorist, and workflow manager at Mystery Box. With a background in IT and photography, he has a passion for using cutting-edge technology to produce compelling content. Sean Robinson has been fortunate enough to explore all aspects of the photographic art and trade. As Associate Marketing Manager with Panasonic, he can bring exciting new LUMIX products to the industry. The GH5S expands on the abilities first introduced in the GH5, including DCI 4K video at up to 60 fps, internal 10-bit 4:2:2 video at up to 4K at 30p, and the fact that both the V-Log L Gamma and Hybrid Log Gamma HDR settings are pre-installed. 4K Anamorphic is present with a de-squeezed preview on the rear screen for easier monitoring. Improvements have been made to the body design, as well, making it easier and faster for operators to access critical settings and hit record. The weather-resistant camera now also features timecode in/out via a BNC to PC adapter, line input support, and a larger red Record button on top. 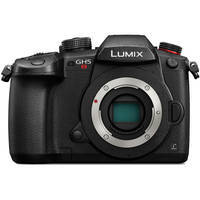 While optimized for video capture, the GH5S represents a significant improvement for Lumix stills quality with the implementation of 14-bit raw capture. This results in dramatically improved dynamic range and color rendition in your images, as well as increased versatility during post-production. The Venus Engine also helps create stellar stills with Multipixel Luminance Generation and Intelligent Detail Processing for sharper and cleaner photographs. Additionally, Three-Dimensional Color Control helps realistically produce a range of tones while Multi-Process Noise Reduction ensures clean imagery even at high ISOs.